Laura Lee Hope. 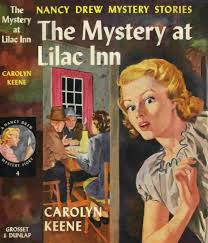 Carolyn Keene. Franklin W. Dixon. Do you recognize the names? You might if you were an avid reader of The Bobbsey Twins, Nancy Drew and/or The Hardy Boys. What do the names have in common? I was surprised to recently learn they are all pseudonyms for a cadre of writers who worked for the Stratemeyer Syndicate, a book packager founded in the early 1900s. Edward Stratemeyer’s career began as a writer for the magazine Good News. In 1899, he created a series called The Rover Boys. Selling over five million copies, the series was wildly successful. Stratemeyer quickly realized there was an untapped market for children’s books that were primarily entertainment rather than the usual stories focused on moral instruction. 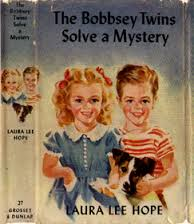 The Bobbsey Twins appeared in 1904 and Tom Swift in 1910. 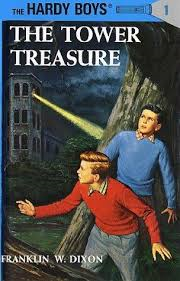 The Hardy Boys series was not written until 1927. Nancy Drew followed in 1930. According to several accounts, Stratemeyer felt that a woman’s place was in the home, but he wanted to capitalize on the fact that the Hardy Boys books were incredibly popular with girl readers. Stratemeyer initially wrote all the Rover Boys, Bobbsey Twins, and Tom Swift books himself, but wanted to publish more than feasibly possible for one person to produce. At that point he hired ghostwriters. He continued to author some of the stories, but was primarily responsible for creating the outline for each book and editing the final product. Interesting viewpoint considering that many well-known women from Supreme Court Justices Sandra Day O’Connor and Sonia Sotomayor to Secretary of State Hillary Rodham Clinton and former First Lady Laura Bush indicate the strong positive influence Nancy Drew had on them. What childhood books influenced your life?